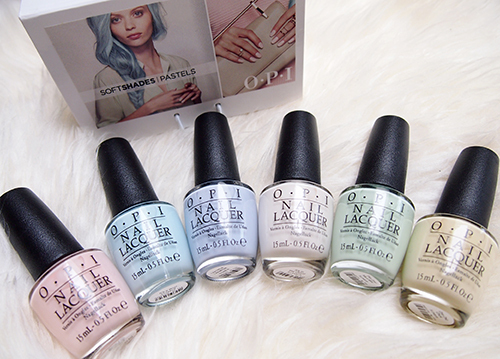 Every Spring, OPI releases a collection of pale and neutral colours for those who prefer more muted palettes for their nails. SoftShades 2016 is all about creamy pastels for a bit of a "mod" look. While last year's SoftShades Collection featured a range of pink-toned sheers and even a glitter, OPI has gone in an interesting direction this year by making every finish a cream. This means the colours can be layered for extra opacity and can be used for a myriad of manis, from french tips to accent nails or other nail art. In my swatches below I've only done two thin coats but you'll see most of the polishes would probably be best with three coats or two thick ones. Stop I'm Blushing! is a pale creamy pink that leans on the peachy side. It's A Boy! is easily my favourite from this collection. It's a gorgeous sky blue and even with only two coats was pretty opaque. I Am What I Amethyst is a light pale lilac. It's not as purple as you would think given the name but is still a nice shade. It's In The Cloud is a basic white though not as stark as Wite-Out. I personally prefer my whites to be a bit bolder but this is a good option for those who don't. This Cost Me A Mint is a cool pale green. It's a true pastel green that doesn't lean turquoise which a lot of other similar shades tend to do. One Chic Chick is a soft yellow and, as you can see, the most streaky of the bunch. It wasn't as yellow as I hoped it would be but is still an interesting colour. I agree, cream shades are my favourite! Milky ones not so much but I do think these are quite pretty and girly. hmmm all very streaky I see, not for me. I prefer polishes that will work with 1 or 2 max coats!